"The most surprising thing about it is, in addition to its depth, how challenging it becomes." Our award winning project “Baboon!®” is our most ambitious production yet. The game is available for PS4 and PS Vita in the european PlayStation®Store, also available in Japan for PS Vita, while an American release for both PS4 and PS Vita is coming soon. "Baboon!®" explores a mix of genres, from adventure to platform, dexterity and physics, making it a unique and enjoyable experience: beware, as it's highly addictive and challenging! Enter exotic worlds filled with Pirate Monkeys, Flying Penguins and endless action-packed challenges. You can use items, interact with dozens of characters to help you in your quest, trade objects in shops, and fight mighty final bosses. Can you unlock every secret? Pirate Baboon, the most perfidious baboon on little monkey’s island, has wreaked havoc with his anti-gravity raygun, he's gone and fired his lethal ray at every banana on the island. Now they are floating around! What can we do now? Our brave hero Tumbili must spring into action, protected with good ol’ grandpa’s helmet, he shoots himself into the most explosive adventure ever! Will you be able to trash evil Pirate Baboon's plans and save the island's inhabitants from doom? Join Tumbili on a great adventure where you'll battle arch enemies, make new friends, take part in an amazing story and solve lots of challenges and side quests to save the day! ✔ More than 60 challenging game levels with different puzzles to solve. ✔ Seven different worlds to explore. ✔ Colorful visuals mixing hand drawn illustrations with prerendered 3D graphics. ✔ Simple controls and easy to understand game mechanics. ✔ Dozens of different objects to use and interact with. ✔ 8 different bombs to use with their unique effects. ✔ A big crowd of characters with stories to unveil. ✔ Secrets and trophies to achieve. 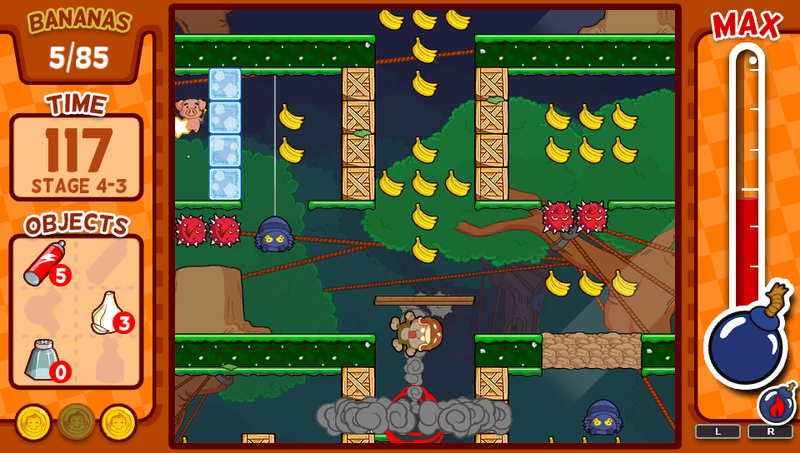 "Despite turning the game off and vowing never to play it again, I kept coming back to Baboon!" "No matter how annoyed I got about its difficulty I found myself going back to Baboon!" Get the OST from the major digital music stores! "Baboon! can make you lose your patience but you'll always be wanting to try again and again"
© Relevo Videogames. All rights reserved. Site theme made by Skywarrior Themes.